Canadian corporations earned $99.3 billion in operating profits in the first quarter, up $2.6 billion or 2.7% from the fourth quarter of 2017. The financial industries sector was largely responsible for the increase. Compared with the first quarter of 2017, operating profits for Canadian corporations were up 7.0% in the first quarter. In the non-financial industries, operating profits were up 0.6% from the fourth quarter of 2017 to $67.8 billion in the first quarter, as operating revenues increased by 1.2% or $11.0 billion. Overall, operating profits were up in 6 of 17 non-financial industries. 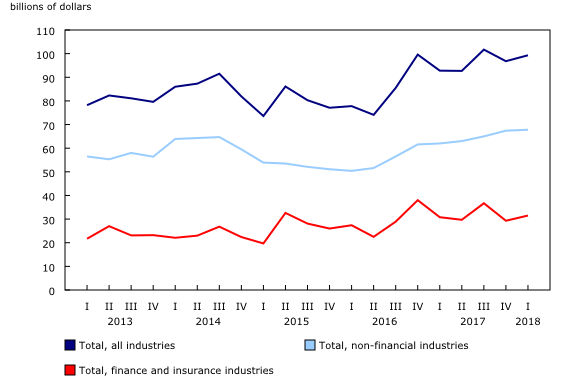 Compared with the same quarter in 2017, operating profits for Canadian non-financial corporations increased 9.4% in the first quarter. Operating profits in retail trade edged down 0.6% from the fourth quarter of 2017 to $5.7 billion in the first quarter. This decrease was led by motor vehicle and parts dealers (-7.3%). The decline was partially offset by a 14.7% or $121 million increase in the operating profits of food and beverage stores. In wholesale trade, operating profits edged down 0.5% from the fourth quarter of 2017 to $7.7 billion in the first quarter. A 7.1% decline in operating profits for food, beverage, tobacco and farm product merchant wholesalers led the decrease for the sector. Other merchant wholesalers partially offset that downturn with a 4.7% increase in their operating profits. Operating profits in manufacturing were up 6.2% from the fourth quarter of 2017 to $16.0 billion in the first quarter, as 8 of 13 manufacturing industries reported increases. Most of the gain in operating profits was attributable to petroleum and coal products manufacturing (+28.3%) and primary metal manufacturing (+37.9%). The increase in primary metal manufacturing is attributable to strong commodities prices, with copper prices hitting a four-year high and zinc prices reaching a 10-year peak in the quarter. These increases were partially offset by a 35.0% decline in air, rail and ship products and other transportation equipment manufacturing, reaching $460 million in operating profit. Excluding petroleum and coal products manufacturing, operating profits for the manufacturing sector rose 2.6% to $13.3 billion. The oil and gas extraction industry reported a $288 million decline in operating profits in the first quarter, swinging from a gain of $125 million in the fourth quarter of 2017, to a loss of $163 million in the first quarter. This decrease is partly attributable to the light-heavy oil price differentials, which reached their highest levels since the fourth quarter of 2013. Operating profits in the financial industries increased 7.5% in the first quarter, from $29.3 billion to $31.5 billion. Operating revenue for the financial industries were down 2.4% or $2.7 billion. However, operating expenses were down even more (-5.5% or -$4.6 billion). As a result, operating profits rose in the quarter. Operating profits for depository credit intermediation increased 2.1% to $13.3 billion. Profits for insurance carriers and related activities rose $2.5 billion in the first quarter to $2.7 billion. Life, health and medical insurance carriers led the increase, posting a $2.4 billion gain for the quarter. This growth was the result of fair value adjustments to actuarial liabilities, which decreased related expenses by $5.9 billion. Net income for the life, health and medical insurance carriers rose from $0.6 billion in the fourth quarter of 2017 to $1.8 billion in the first quarter. Property and casualty insurance carriers' operating profits increased 10.9% to $1.1 billion. Data on quarterly profits in this release are seasonally adjusted and expressed in current dollars. Quarterly financial data for the period covering the first quarter of 2015 to the fourth quarter of 2017 have been revised following the reconciliation to the 2015 and 2016 annual series. Quarterly financial statistics for enterprises are based on a sample survey and represent the activities of all corporations in Canada, except those that are government-controlled or not-for-profit. An enterprise can be a single corporation or a family of corporations under common ownership and/or control, for which consolidated financial statements are produced. 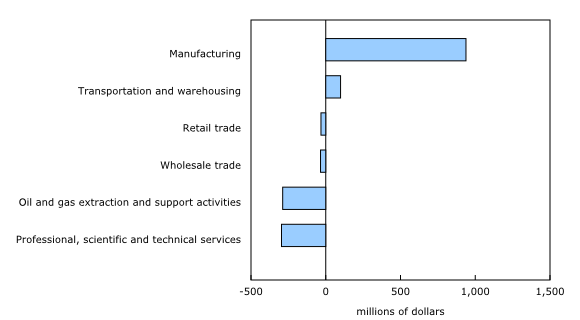 Profits referred to in this analysis are operating profits earned from normal business activities. For non-financial industries, operating profits exclude interest and dividend revenue and capital gains/losses. For financial industries, these are included, along with interest paid on deposits. In this release, all profits are operating profits unless otherwise stated. Operating profits differ from net profits, which represent the after-tax profits earned by corporations. For more details on the concept of actuarial liabilities, consult the page Actuarial Liabilities. Real-time CANSIM tables 187-8001 and 187-8002 will be updated on June 11. For more information, consult the document Real-time CANSIM tables. Financial statistics for enterprises for the second quarter will be released on August 23. Aggregate balance sheet and income statement data for Canadian corporations are now available in CANSIM at the national level for 22 industry groupings. The publication Quarterly Financial Statistics for Enterprises (Catalogue number61-008-X) is no longer released. Data from the Quarterly Survey of Financial Statements are available in CANSIM.